Two feet of snow could arrive this week at Lake Tahoe ski resorts. The winter storm warning is in effect from 10 p.m. Wednesday through 4 a.m. Friday for areas that include Incline Village, Nevada, Truckee and South Lake Tahoe. And the good news for the region is Tuesday’s snow showers are just the beginning. Lake Tahoe ski resorts are expected to see snow seven of the next nine days. 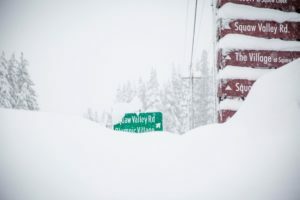 Currently, there are six Lake Tahoe ski resorts open – Squaw Valley Alpine Meadows, Heavenly Mountain, Northstar California, Mt. Rose, Kirkwood Mountain and Boreal Mountain. This week’s snow will likely mean more resorts will be opening for skiing and snowboarding. The National Weather Service (NWS) has upgraded a winter storm watch to a winter storm warning Wednesday night for Lake Tahoe. There could be 2 feet of snow over the next few days. The first in the series of systems will arrived in the Tahoe Basin on Tuesday afternoon. “Accumulating snowfall may lead to some travel impacts by this evening across the passes on Interstate 80 and Highway 50,” warns the NWS. The NWS says up to a foot of snow is expected in the mountains with 2 feet or more above elevations of 7,000 feet into Friday. Up to 3 feet (90 cm) is possible in the highest elevations further south from Bridgeport to Mammoth Lakes. The system hitting Lake Tahoe will also deliver breezy conditions with winds through valleys in the 25-35 mph range and isolated gusts on high mountain peaks reaching 45 mph. A colder, wetter storm is in the forecast Wednesday night through early Friday morning with 1 to 3 feet of white powder forecast for elevations above 7,000 feet. Snow levels could drop as low as 5,000 feet with this storm, causing more travel impacts. A third even colder system is expected to arrive Saturday. Forecast models are showing snow levels dropping to 4,000 feet and lower elevation spots such as Truckee could see snow. This would be the lowest elevation snow the region will have seen this season and present hazardous driving conditions.